Are your apps ready for IPv6 users? Many organizations have started to support access to their applications via IPv6 addresses, and along with that comes the need to include IPv6 traffic in the load test plan. Indeed, we recently tested our customer portal to be sure it was accessible via IPv6 (it is – the application is deployed on Google’s AppEngine infrastructure, which includes IPv6 accessibility baked-in). Of course, before you get to load testing, you should start with a basic connectivity check to ensure your website is accessible from IPv6 routes – you can use a tool such as ipv6-test.com, which checks both the DNS and website IPv6 configuration. If you need to check the connectivity from your workstation you can start by pinging ipv6.google.com. For more details, you can visit test-ipv6.com – this will perform several checks to determine if you can access IPv6 websites from your browser. 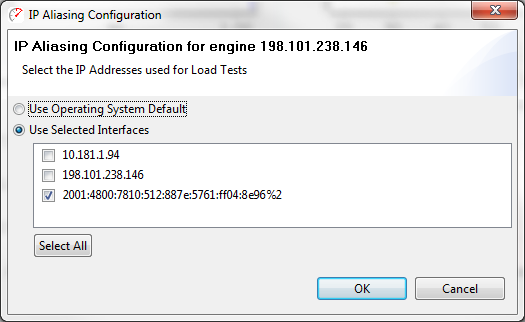 This dialog selects which IP addresses the load engine will assign to virtual users. When more than one is selected, they will be assigned to virtual users in round-robin fashion. Simply enable the IPv6 address and, if desired, disable the others. In this example, I’ve enabled only the IPv6 address – which means all virtual users (VUs) running on this engine will use that address. After each engine has been configured, you are done – that is all there is to it! If you have any questions, please comment here or use our support system.